Everyone knows drinking up to 8 glasses of water each day is important. But what makes water so important? Water makes up at least 60% of the body weight. It makes up the base of body fluids like blood. Water is essential for normal body metabolism. It transports gases and nutrients to the target site. It helps clear away toxins and wastes from body. 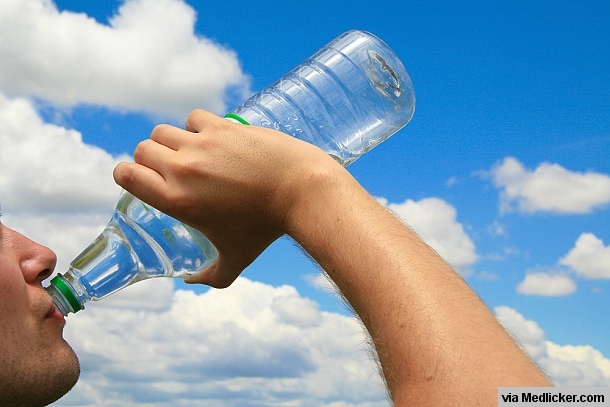 Water, in the form of sweat, helps in regulation of body temperature. What happens if the level of water inside human body falls below normal? This condition is known as dehydration. Now you know what water normally does in human body, you can appreciate the effects of decrease in body water. But how would you know that you’re suffering from dehydration? Are there any warning signs that can tell you when you’re dehydrated and can save you from the side effects of shortage of water? Yes, there are. 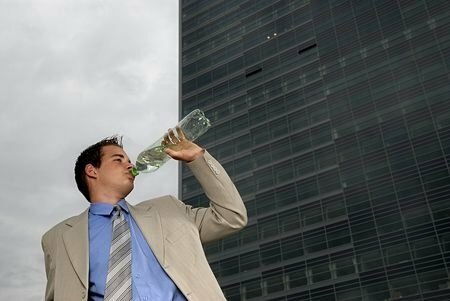 This article will tell you about 10 warning signs that show that your reserves of body water and running low and you should drink water soon. One of the earliest symptoms of dehydration is dryness of mouth. Once your brain senses that your reserves of water are running low, it induces dryness of mouth and lips. It is followed by cracking of lips, dryness of tongue, thickness of saliva and difficulty in swallowing. Water makes up most of muscles. Also water concentration is critical for maintaining the concentration of minerals (including calcium, sodium and potassium) inside the cells. Once the reserves of body water decrease, there is an imbalance in the concentration of minerals as well. These minerals are essential for normal nerve conduction. Once the amount of these minerals is thrown out of balance, abnormal impulses are fired by neurons. The result is twitching of muscles and cramps. As mentioned earlier, water is essential for maintaining body temperature. Perspiration (sweat) takes away most of the heat with it as it evaporates. If you’ve not had water for a long time; your body will be left with no water to spare. Body will try to conserve water through whatever way possible. One such way is to decrease the production of sweat. The result of which is flushed skin and increased body temperature. Water isimportant for maintaining brain function. As explained earlier, water is critical for maintain mineral balance. Decreased amount of water can lead to imbalance in the level of these minerals and abnormal nerve impulse firing. Your brain might interpret these abnormalities in the form of headache. Moreover, water is the major constituent of blood. Decreased level of water means decreased volume of blood. This, in turn, leads to decrease in blood pressure. Your brain can interpret this decrease in blood volume in the form of headache. Water is the major constituent of blood, as explained earlier. The function of blood is to circulate inside the body and provide each organ with essential metabolites. When the amount of water in body decrease, result is decrease in blood volume and hypotension. Hypotension leads to decreased supply of blood to the brain and brain starts to function in an abnormal way. The result is a feeling as if everything is spinning (dizziness). Brain needs timely supply of oxygen and metabolites to function properly. Hypotension, due to dehydration, decreases the supply of blood to the brain. When the supply of blood to the brain decreases, so does the supply of oxygen and metabolites. This stops the functions of brain and it becomes very difficult for you to concentrate even on simple things. This can lead to impaired thinking, learning and execution skills. The water we drink mixes up with the food we eat. This is important in several regards. First, the water mixed with food speeds up digestion. Second, it helps in absorption of the digested components of food. Third, water speeds up the movement of food through the gut. Proper gut movements are largely dependent on drinking adequate water. If you’re dehydrated for a long time, your body will try to do everything it can to conserve maximum amount of water from any source possible. When you’re dehydrated, the feces moves very slowly through the gut and gut absorbs every last bit of water from it. Result is constipation. The passage of stool becomes difficult, painful and the stool passed has hard consistency. The main function of kidneys is to excrete all waste metabolites from the body. For this purpose, kidneys dilute these metabolites with water and excrete them in the form of urine. Urine, like feces, is a reserve of water that body use to draw water in the time of need. When your water reserves are running low, several hormones are released inside your body that make kidneys drain as much water from urine as possible. The result is scanty urine. Moreover, the color of urine is due to the metabolites present in it. When there is excess water in your body, it is excreted in the form of white, large volume urine. On the other hand, once you get dehydrated water is absorbed by the kidneys and urine turns dark yellow. In extreme cases, you might not pass urine at all. Another way your body responds to decrease in water reserves is by stimulating the respiration centers of brain. Result is increase in the rate of respiration. The rate increases but breathing becomes shallow. Decrease in blood pressure is compensated by increase in heart rate. The pulse becomes rapid but is decreased in volume. Skin turgor (normal tightness) is mainly due to water inside the skin cells. Once you lose water, the tightness of skin decreases and your skin looks pale and less elastic.